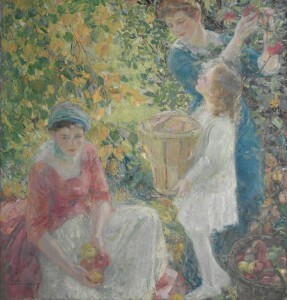 The Apple Gatherers was particularly well received by critics at the Armory Show. A reviewer in the New York Evening Mail singled it out as Anderson’s “largest and finest picture,” and the writer for the New York Herald called it “glorious.” 3 Anderson offered the work for sale at the Armory Show for $1,500, but it failed to sell. Joseph Edgar Chamberlain, “More of the International Exhibition,” New York Evening Mail, February 21, 1913, 6; “Art Extremists, In Broadsides of Lurid Color, Invade New York and Capture an Armory,” New York Herald, February 17, 1913, 10. Karl Anderson is best known for his impressionistic portrayals of young women in sun-dappled landscapes or quiet domestic interiors. Born in Ohio, Anderson moved to Illinois in 1893 to enroll at the School of the Art Institute of Chicago. In 1900 he traveled to Paris, where he studied at the Académie Julian, the Académie Colarossi, and in the studio of Alphonse Mucha, exhibiting at the 1903 Salon d’Automne. Anderson painted outdoors in rural Holland and spent time in London before returning to New York in 1904. Working as an illustrator for popular magazines such as Scribner’s and Vanity Fair, Anderson saved enough money for an extended trip of independent study in France, Spain, Italy, and Holland in 1910. He spent that summer at the art colony in Giverny, where he was influenced by the high-keyed, decorative Impressionist style of his friend Frederick C. Frieseke. In 1912 Anderson settled in Westport, Connecticut, where he became the leading member of the artists’ colony there between the two World Wars. Although he receives little attention today, Anderson was well regarded during his lifetime and received honors at the Carnegie International Exhibition in Pittsburgh, the Pennsylvania Academy of the Fine Arts in Philadelphia, and the National Academy of Design, the National Arts Club, and the Salmagundi Club in New York. See entry for Anderson in Carol Lowery, A Legacy of Art: Paintings and Sculptures by Artist Life Members of the National Arts Club (New York: National Arts Club, 2007), 44-45; Robert R. Preato, “Karl Anderson: American Painter of Youth, Sunshine and Beauty,” Illuminator (Winter 1979-1980), 8-16; F. Newlin Price, “Karl Anderson—American,” International Studio 76, no. 306 (November 1922), 132-139; Sandra L. Langer, “Decorous Beauty: The Paintings of Karl Anderson,” Arts Magazine 59, no. 4 (December 1984), 74-76; and Karl Anderson of Westport (Weston, Connecticut: Westport-Weston Arts Council, 1984). For the artist’s observations from his sojourn, see Karl Anderson, “European Reminiscences,” The Bellman 8, 190 (March 5, 1910), 292-294. Milton Brown, The Story of the Armory Show, rev. ed. (New York: Abbeville Press, 1988), 49, 83, 228.